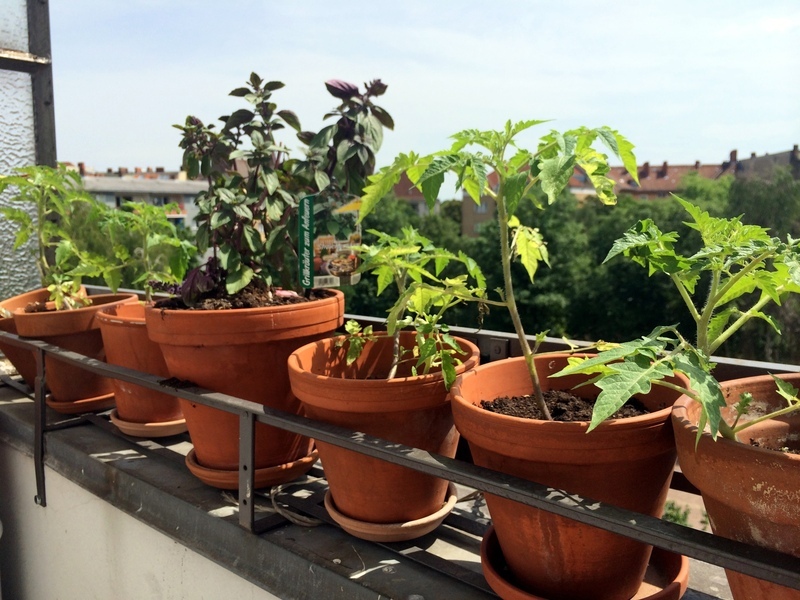 It's time to check in on my little garden of five tomato plants and a purple basil plant. I keep forgetting to take photos every day, so here's one from earlier this week. Well, the first and third options are out of the question for me, my plants don't have any leaves to spare, and I dislike bugs of all sorts enough that I wouldn't want to pick them off! The fourth is great but difficult, since it either involves catching some ladybugs in the wild or mail-ordering them, which feels like overkill. I ended up going for the second option, since garlic is easy available, and I could use the rest of it in tomato sauce too. I've been spraying the plants every night, and for the first few days after that, it seemed to be working. There weren't as many aphids around (though always a few) and the plants seemed to be doing better and better, though this could have just been due to them growing and enjoying the hot weather we had over the weekend. Yesterday, I took a closer look at the plants and the aphids seem to be making a comeback. Each plant have several of them perched around on the leaves and stalks, so I zapped those blood-suckers (well, sap-suckers) again with my garlic spray. If they don't go away completely, I may get over the ick-factor and start picking them off one by one. As for the heatwave we had up here over the weekend, I was really worried that it would be too hot for my poor plants. I made sure to water them every night, sometimes once in the morning before I left the house, and they really seem to be thriving. It's even getting to the point where I'm wondering if I should put in some sort of stick or trellis for them to grow up around!